VIDEO OF SADDAM TRIAL BACKGROUND HERE. “I don’t care about human rights, he should be executed.” an Iraqi. 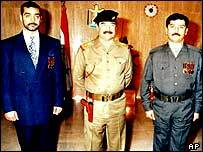 Saddam, flanked by his sons Qusay and Uday, during his reign of terror. The Iraqi court set up to try Saddam Hussein released a tape showing the ousted leader being interrogated, in an apparent bid to assert its independence after the government called for a swift trial. The video was released amid heightened tensions between the country’s once-oppressed Shiite majority and the disempowered Sunni Arab minority, and on the same day that a Sunni group accused the government of ethnic cleansing. “I have given the approval to release the tape,” Judge Raed al-Juhi, a member of the Iraqi Special Tribunal, said without elaborating. CNN television showed brief footage of Juhi questioning a bearded Saddam with longish black hair who was wearing a tieless white shirt and a black vest, reportedly over the 1982 killing of 143 residents of Dujail, a Shiite village northeast of Baghdad. Saddam is accused of ordering revenge murders after villagers allegedly tried to assassinate him, along with a litany of other alleged crimes against humanity. If convicted, the former president faces the death penalty. The footage is also likely to cause controversy after newspapers in May published photographs of the 68-year-old Saddam in his underwear along with shots of other high-value former regime members currently awaiting trial. The pictures, which the newspaper said it received from US military sources, drew protests from human rights and Muslim groups, who complained they violated the Geneva Conventions over the treatment of prisoners. Iraqi officials have suggested a trial could start in two months but the special tribunal has said no timetable has been set. Four of Saddam’s former aides were also questioned about their alleged role in the 1988 Anfal campaign against the Kurds, which included a chemical gas attack that killed 5,000 people in the village of Halabja. Such officials are well known to Iraqis, who often saw them on television beside Saddam and never thought the most powerful people in their country could be tried. On the film, this time with sound, they seemed less energetic than Saddam as the judge asked about their previous positions in the administration and then focused on their activities in the late 1980s, when Kurds say Iraqi forces and intelligence agents killed thousands and razed villages. Taher Tawfiq al-Ani, secretary of the Revolutionary Command Council’s northern affairs committee, appeared tired as he recalled his involvement in Kurdish territory. The 68-year-old Saddam looked drawn and tired, the first time he has been seen in a video since his arraignment on July 1, 2004, in Baghdad on broad charges including killing rival politicians over 30 years, gassing Kurds in the northern town of Halabja in 1988, invading Kuwait in 1990, and suppressing the Kurdish and Shiite uprisings. Saddam will be tried on 12 charges. Here is more on his legal team from last week. Jayson at Polipundit comments on how the MSM is reporting this story.